Well, that’s it. Week 52. The end of 2014! A whole year of collages and good memories including tons of new firsts and milestones for us as a family of four. 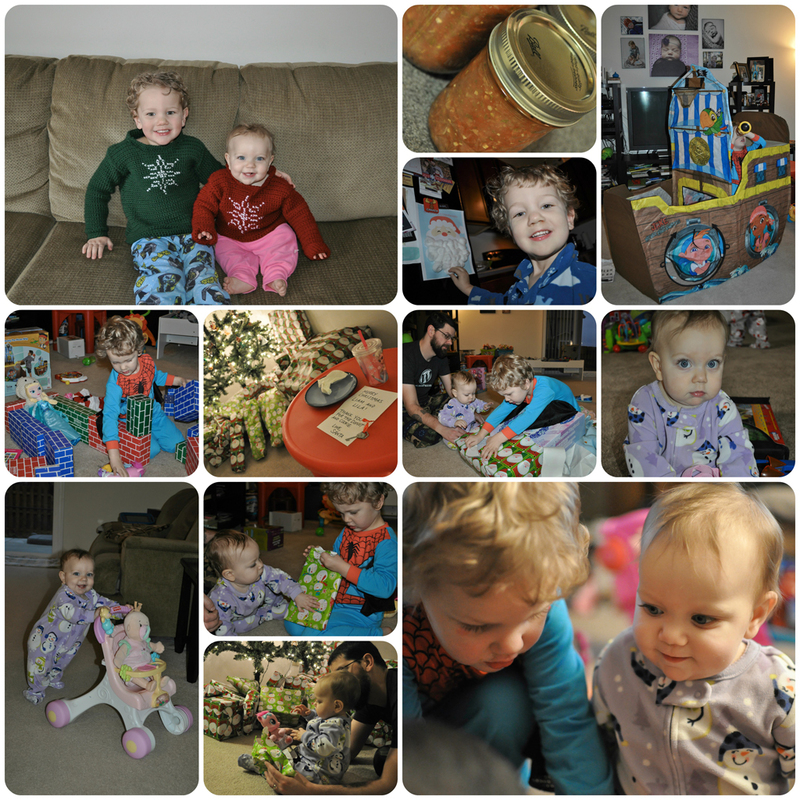 This past week we celebrated Christmas, and it was magical. It was the first year that Liam really understood and was looking forward to Santa coming, and of course Lila’s very first Christmas. In true Karpiuk style there was DIY: I finished crocheting some matching holiday sweaters for the kids and we made salsa and brown sugar scrub to gift to family and friends. Liam counted down to Christmas Eve by putting up a cotton ball each day to make Santa’s beard fill up, and he squealed with excitement when he realized he put on the last cotton ball, which meant Santa was coming that night. He wanted to leave cookies, donuts and milk for Santa, a note that said “thank you” in advance, and then he brought home “reindeer food” from school that we sprinkled outside for the reindeer. Liam learned that Santa comes down the chimney and then realized that we didn’t have a chimney, so we started a new tradition where we left a special Santa Key out for the big guy instead. It appeared as though Santa enjoyed the goodies, because he left a note and returned the key for the kids to find on Christmas morning. Lila being 10 months old compared to Liam’s first Christmas when he was only 6 months old meant that she was able to actually participate a bit in the festivities. Lila gleefully tore into wrapping paper and played with the paper and boxes more than the gifts inside for her. Liam was happy to help his sister open her gifts, too, and both seemed to have a wonderful Christmas. We all had a wonderful Christmas filled with plenty of relaxing and family time, the best gift of all. Here’s to 2015 being another year of happiness and good times!